Medifirst Solutions Inc (OTCMKTS:MFST) investors have reason to be excited given new developments and the recent shareholder update. The share price has more than double since the beginning of the year. It had a healthy pullback and is now beginning to advance steadily on significant volume. Shares traded yesterday hit over 1.3 million exchanging hands. 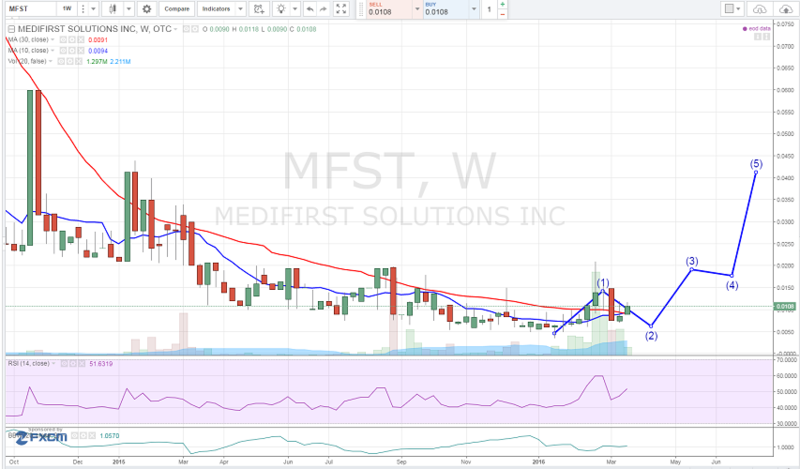 MFST stock currently is trading at $0.0117 and should easily double from current levels given the momentum. MFST believes that its laser devices are very unique and offer an easy-to-use, mobile, affordable and effective product for many different health care professionals. The Time Machine Laser System can serve to enhance the current treatment protocols of various health care professionals, as well as produce additional revenue streams from the treatment range MFST believes The Time Machine Infrared Laser System is capable of delivering. Medical Lasers Manufacturer, Inc., a Medifirst subsidiary, will specialize in producing high quality diode-pumped solid-state lasers. The laser division including products and treatment programs will be operated out of MLM. Our focus is to help patients with specific cosmetic skin conditions, as well as relief of muscle and joint pain, muscle spasm and inflammation. This could potentially be a significant business bringing in tens of millions in additional revenues once approved by the FDA. On January 7, 2016, MFST entered into a Securities Purchase Agreement with an accredited investor for the sale of convertible redeemable notes in aggregate principal amount of $251,803. On January 7, 2016, MSFT and the Investor conducted the first closing under the Purchase Agreement. MSFT is currently trading at a $0.5 million market valuation. From a technical perspective, the chart looks to be making headways with the breakout in volume and the long base it has established over the last year. The stock could easily double, triple, or quadruple if the FDA approves its new product. It wouldn’t be surprising to see a slew of promotions or capital raising to fund this new venture once approved. We will be updating on MSFT when more details emerge so make sure you are subscribed to Microcapspot so you know what’s going on with MSFT. Disclosure: we hold no position in MSFT either long or short at the publication of this article and we have not been compensated for this article.